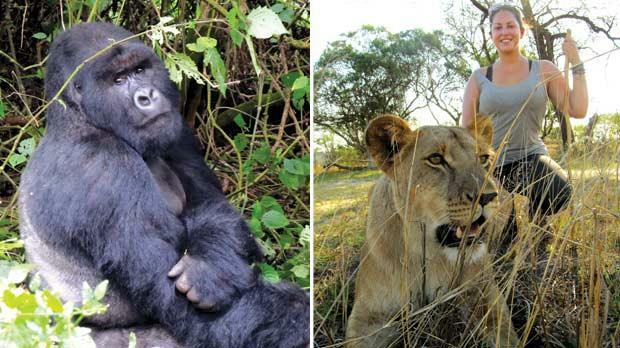 Hannah Wayte meets beauty and the beasts on an overland adventure in Africa. Big welcome by the students at Lake Bunyonyi school in Uganda. 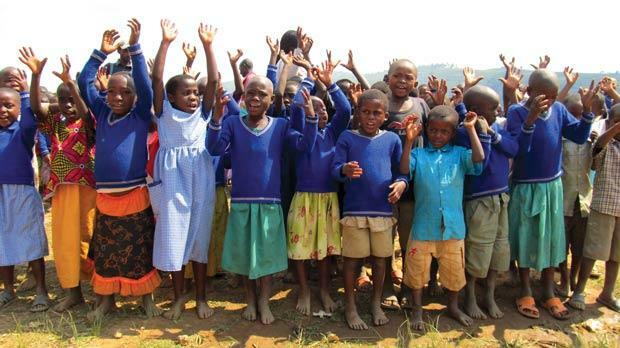 “Mzungu!” screamed a handful of kids, smiling broadly and giving us a show of waving hands as we drove by in the yellow truck we had begun to call home. Such an enthusiastic roadside greeting, from children and adults alike, was one of the only constants in an ever-changing landscape as we drove through East and South Africa – it’s also one of the many reasons I’m glad of my choice to travel the continent overland rather than by air. I have always been a fan of road trips. 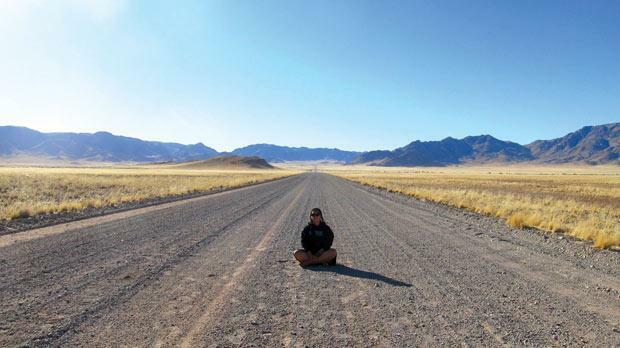 Once you get past the tedium of being confined in a small space for many hours a day and figure out a seat-jiggle good enough to stop your behind going numb, the positives of overland travel far outweigh the negatives. The journey I embarked on late last year was a road trip on a grand scale – my itinerary took me through 11 African countries, from Kenya to South Africa, all in the back of a massive Scania truck named Twiga (Swahili for ‘giraffe’). The lush, green hills of Rwanda, barren Tanzanian planes, the shores of Lake Malawi and Namibia’s desert wastes are just some of the incredibly diverse terrains we drove through. Doing an overland trip with a group of people is not for the faint of heart. At full capacity we could fit 24 people in the back of the truck – while this meant that we had some fantastic sing-alongs, a 14-hour drive day could also send the biggest extrovert running scared. A group of 24 travellers meant 26 mouths to feed (guide and driver included) and we took it in turns to cook. I will never be fazed by a dinner party again. Our primary accommodation was in campsites, although we did occasionally stay in hostels and we were often able to upgrade to a room for a small fee (though not without some derision from the rest of the group). The standard of campsites varied greatly and how developed an area seemed was not necessarily indicative of whether or not we would have a hot shower that night. In sweltering climates this was not a problem – in colder conditions we simply learnt to be tolerant, smelly backpackers. Before setting out on this trip I had never pitched a tent and I wasn’t the only one, but we soon got the hang of what made the best camping ground and how to set up in minutes. That said, waking up at 4.30am to take down your tent in the dark never gets easier with practice. There are a number of companies offering overland trips in Africa and not all are about living rough. Some of them can be quite luxurious, with an accompanying chef and a comfortable bed every night. The type of trip you choose is all down to your budget and how adventurous you want to be. Also, what may appear to be downsides of low-budget overland travel were actually fodder for some of the best stories I came home with. I recently came across a quote by Norton Juster: “The most important reason for going from one place to another is to see what’s in between.” Therein lies the top benefit of overland travel. Driving along in our truck, we got to see and actively participate in the daily life of the countries we drove through. Most days we would pull over and shop for fruit and vegetables at roadside stalls. Not only were we helping the community but it also gave us the opportunity to interact with the locals, even if it was just through smiles and hand gestures. Though we arrived as strangers, in most countries we were approached with shy curiosity and left on friendlier terms. One of the hardest parts of travelling through East Africa is getting from A to B. Local bus routes are unreliable and train connections are sparse. Naturally, having a truck at your disposal completely eliminates that problem. It also means that isolated areas are within your reach – we once stopped in a small Rwandan town where no foreigner had set foot in years, and some of the younger children had never seen a white face. On days when we didn’t have time to make our own lunch, we would stop at local spots along the way and this gave us a taste of traditional meals, although in East Africa that meant stew, stew, samosas and more stew. Travelling in this way gave me the freedom to get under Africa’s skin and embrace it in a better way than I could have as a solo traveller. Camping out in the bush to the sound of hippos grazing nearby, sitting on a rock, alone in the middle of a desert, changing hemispheres and observing the starry sky change night after night – all these humbling moments served to create a beautiful portrait of Africa that lives on in my memory and tugs at me to return. Animal attractions – Hannah’s best moments in Africa. Silverback mountain gorilla in Rwanda. Right: Walking with lions at Antelope Park in Zimbabwe. 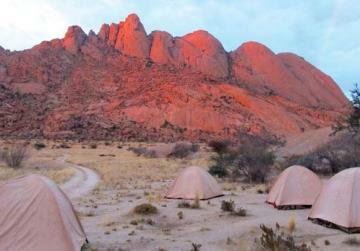 Bush camp at Spitzkoppe in Namibia. • Spending an hour with a family of critically endangered mountain gorillas, only accessible by trekking through the Virunga mountains, which are nestled between Uganda, Rwanda and the Democratic Republic of Congo. • Visiting local schoolchildren and a Batwa community atop an island in Lake Bunyonyi, Uganda. 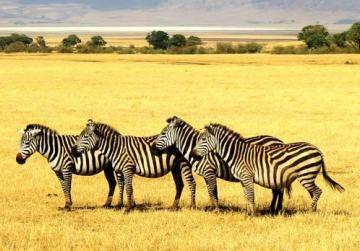 • Three-day safari in Tanzania’s famous Serengeti, Ngorongoro Crater and Lake Manyara National Park. Top moments: include witnessing a pride of lions hunting a buffalo, a cheetah hunting a gazelle, and camping out in the bush to the sound of hyenas. Zebras at Ngorongoro crater in Tanzania. • Four days in paradise, a.k.a. Zanzibar. Blue sky, clear sea and white sand, all stretching as far as the eye can see. Bliss. • Antelope Park, Zimbabwe – home to the ALERT lion rehabilitation programme, a multi-phase conservation initiative. During my stay here I learnt about the breeding programme, walked with lions, visited the cubs, watched the adult males feed, and went on a night drive to watch young lions hone their hunting skills. • Swimming in Devil’s Pool on the Zambian side of Victoria Falls. This pool forms only at periods of low water and allows daredevils to swim at the rather precarious waterfall edge. • Gliding along the canals of Botswana’s Okavango Delta in a mokoro (dugout canoe). • Skydiving from 10,000ft and quad biking over the dunes in Swakopmund, Namibia. • Visiting Stellenbosch’s best wineries (with a designated driver, of course). • Cage-diving with great white sharks in Gansbaai, South Africa.